The expanding role of the dog over recent decades as an anthropomorphized member of the modern American family has led to an increase in dog owners’ expectations of their veterinarians. With social media, where the old adages about the number of people a dissatisfied client will tell about their experience can be easily multiplied by a factor of hundreds, the pressure to meet client expectations is more intense than ever. Far more actionable than the commonly used genetic testing for canine breed identification, canine genetic disease testing is an accurate and reliable tool to help veterinarians meet their clients’ expectations in new ways. Genetic testing for a variety of inherited diseases has become commonplace in the dog breeding community to help breeders produce puppies free of particular maladies. However, as we know, not every dog seen in practice is the product of two purebred parents which have been genetically tested and vetted to make sure they are a good genetic match. Having a solution to easily perform canine genetic disease testing for any dog in a clinical setting, no matter the breed, adds a level of sophistication and progressiveness to your practice which can also supplement and improve your overall quality of care and client satisfaction. Canine HealthCheck, developed by Paw Print Genetics, is a powerful genetic testing tool which allows for the screening of any dog, purebred or mixed breed, for over 150 different genetic mutations associated with canine diseases and traits, allowing you to play an active role in the genetic health of your patients. Few situations in the life of a veterinarian are more likely to induce nightmares than the thought of having to tell an owner about severe complications or death of their animal placed in your care for an elective surgical procedure. 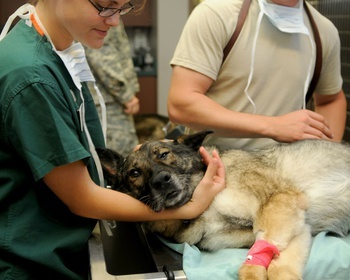 Though veterinarians are fully aware of the inherent and potentially serious risks of procedures such as neuters or spays, right or wrong, the routine nature of these procedures in veterinary medicine have led most veterinary clients to expect their animal to be returned to them without incidence. The Canine HealthCheck, tested well before these procedures are contemplated, can help ensure that their expectations are met. One of the most common categories of inherited diseases leading to surgical complications are those which cause increased blood clotting times. Canine HealthCheck tests for over 25 different genetic causes of excessive bleeding, including multiple mutations associated with various types of von Willebrand disease. Knowledge that a dog has one of these clotting disorders allows for surgical preparation involving the acquisition of blood products, or in some cases, the referral of the patient to an institution that may be more properly equipped to handle the potential for excessive bleeding. Another common genetic concern in many herding breeds is the condition known as multidrug resistance 1 (MDR1) which is caused by a mutation in the canine ABCB1 gene. Most commonly associated with collies and shepherds who have been administered ivermectin, dogs affected with MDR1 have also been documented to have severe adverse reactions to over a dozen other medications including chemotherapeutic drugs, common pre-anesthetic drugs, and other antiparasitic agents. Though severe reactions are most commonly seen in dogs inheriting two copies of the MDR1-associated mutation (one from each parent), dogs inheriting only a single copy of the mutation may also need to have problem drug dosages reduced in order to prevent neurological side effects. Genetic testing can accurately assess the number of copies of the mutation a dog has inherited so appropriate measures can be taken to protect the patient. As a surprise to some, a couple of sighthound breeds have also been identified with MDR1 (e.g. silken windhound and longhaired whippet). Though many veterinarians are familiar with herding breeds being at risk for MDR1 complications, testing mixed breed dogs for MDR1 may be particularly helpful given the inherent challenges of phenotype-based predictions of the breeds which make up any given mixed breed dog and the fact that only one copy of the mutation is sufficient to cause adverse side effects in many cases. In addition to the benefits genetic testing can provide to prevent adverse surgical or drug events, knowledge that a dog may develop a late-onset disease can be beneficial for the patient, the dog’s owner, and the veterinarian. Two of the biggest benefits to knowing a dog is at risk of developing a late-onset disease are that the time from first clinical signs to diagnosis and the cost associated with finding the diagnosis can both be greatly reduced. For instance, test results showing that a dog is at risk for degenerative myelopathy (DM) may prevent the necessity for advanced diagnostics such as radiographs and MRI when the dog is presented. Since there is not an antemortem test available to definitively diagnose DM, classic clinical signs of DM combined with a genetic test showing that the dog is at risk for the disease are just as valuable in DM diagnosis as any radiographic or MRI result. Thus, saving significant time and money to reach a conclusion. In situations where the disease identified with genetic testing has a good treatment option (e.g. vitamin supplementation for intestinal cobalamin malabsorption), treatments can begin sooner and the lower cost of diagnosis may prevent euthanasia and allow the dog’s owner to put more financial resources in to treatment. Lastly, knowledge that a dog is likely to develop a disease with age allows the dog’s owner to prepare for any inconveniences or life changes that may be a necessary component of managing the condition (e.g. progressive retinal atrophy and eventual blindness). Since the owner is not caught completely off guard by the diagnosis, it may be more likely that the owner will be prepared for what is to come and less likely to make a rash decision resulting in premature euthanasia of a dog that could still live a productive and happy life. Whether improving the chance of a dog being returned safely home after a surgical procedure, preventing adverse drug reactions, making a faster diagnosis, implementing treatment sooner, planning for future challenges, or saving your clients time and money, canine genetic disease testing is likely to improve the clinical outcomes of your cases and improve the overall medical experience of your patients and their humans! Dogs can be tested for genetic diseases at any age. However, testing a dog at an early age is most beneficial. Performing a Canine HealthCheck during a puppy’s first hospital visit is ideal for disease anticipation or treatment and is a great preparation for an impending spay, neuter, or other procedure. If you have questions about canine genetic testing or have specific questions about how to implement the Canine HealthCheck in your practice, please contact the Paw Print Genetics laboratory (AskUs@pawprintgenetics.com or 509-483-5950; Monday through Friday, 8 am to 5 pm Pacific time). Casey Carl, DVM is the Associate Medical Director at Paw Print Genetics.